Back when Obama was still just a Chicago pol, few would have mistaken him for the leader who would help give birth to a new clean-energy economy. In the late 1990s, the future President described himself as a "strong supporter" of downstate coal interests, voting in the Illinois legislature for billions of dollars in loan guarantees for new dirty power plants, and for a bill that condemned the Kyoto Protocol. By 2007, political alliances were shifting. 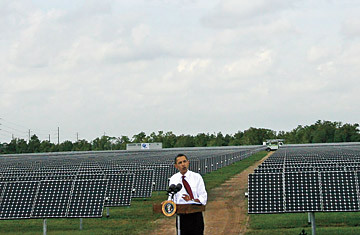 When he ran for President, Obama proposed a 10-year, $150 billion green-jobs plan at a campaign stop in New Hampshire; when the economic-stimulus plan was adopted in 2009, he pushed through billions of dollars for green jobs and alternative-energy strategies that included almost $20 billion for energy efficiency, $26 billion for renewable and alternative energies and $10.5 billion for electrical-grid modernization. The investments went a long way toward fulfilling the lobbying efforts of several core Democratic constituencies  unions, environmentalists and high-tech companies  which had been mounting more aggressive campaigns on behalf of the clean-energy sector as the Bush era came to a close. Inside the new Obama White House, the President's team included green-energy boosters in the policy skull sessions, and regular meetings with outside advisers and nearly weekly public events were held to promote green energy as a way to create jobs. Some of the heaviest hitters were on the President's Economic Recovery Advisory Board, a committee of corporate leaders and economists whom Obama brought inside the White House to advise on everything from regulatory reform to global warming. Formed during the transition, it included top fundraisers such as Hyatt family scion Penny Pritzker, Obama's Silicon Valley ally Doerr and two ambassadors from Wall Street, UBS's Robert Wolf and private-equity investor Mark Gallogly. This foursome and their spouses had collectively given roughly $2.4 million to Democrats since 2000. Doerr's venture-capital firm, Kleiner Perkins Caufield & Byers, made more than $1 million in donations to Democrats since 2005, and Ellen Pao, one of Doerr's clean-energy partners at Kleiner Perkins, gave $50,000 to Obama's Inauguration committee, according to the Center for Responsive Politics. Gallogly, Wolf and Pritzker hosted a series of meals with business leaders and White House officials last year, blurring the lines between policy outreach and a potential donor-recruitment operation. Though having campaign donors on advisory boards is not without precedent, Democratic influence brokers took notice. "It's the Lincoln Bedroom with a little more cover," explained a prominent Democratic lobbyist, referring to a Clinton-era practice of permitting top donors to spend the night at the White House. The 17-member PERAB, which meets by conference call most Fridays, is best known for its leader, former Federal Reserve Chairman Paul Volcker, who has persuaded Obama to take a more aggressive approach to banking regulation. But it also includes several executives whose firms stand to benefit from more federal funding of green technology  people like General Electric's Jeffrey Immelt and Caterpillar's James Owens, both of whom supported John McCain. Doerr took the lead on the group's energy subcommittee, drafting a 2009 memo that called for increasing fees on carbon pollution and changing rules to encourage electric utilities to move to a unified smart grid, which would benefit an industry in which he has significant investments. Doerr's journey to the Roosevelt Room is the stuff of Silicon Valley legend. Born in St. Louis, Mo., he got his first tech job in 1974 as an Intel engineer and went on to become a prescient bankroller of such companies as Google, Compaq and Amazon.com He later helped fund TechNet, the valley's first major Washington lobbying effort, and became close friends with then Vice President Al Gore, who has since become a partner at Kleiner Perkins. Doerr's enthusiasm and vision have been welcomed by the Obama team, just as they were by the Clinton Administration. In a recent interview, Obama mentioned Doerr as one of the corporate leaders he most admires. Doerr was also one of a handful of American executives invited to Obama's first state dinner, with India's Prime Minister in November, along with two other green-energy boosters, GE's Immelt and Honeywell's David Cote. See the top 10 political gaffes of 2009.